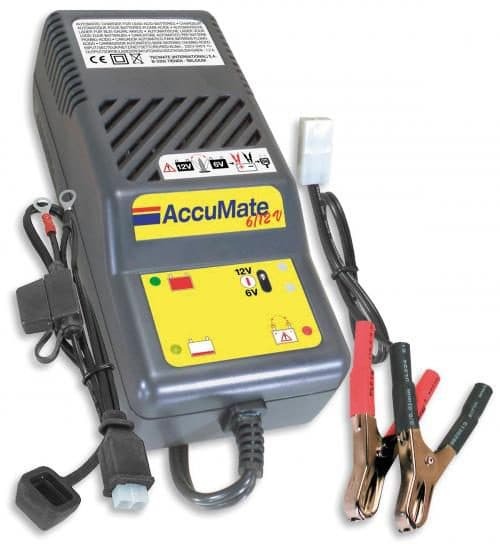 AccuMate 6-12 is a versatile, 4-step, automatic battery charger and maintainer for all types of 6v & 12v wet, gel and AGM lead-acid batteries. The charger comes complete with crocodile clips for direct connection and also a waterproof remote connection system to fit most motorcycles and cars. This is the latest version of the original Accumate charger used by across the world. Great for keeping the battery in your motorcycle or car charged up ready for use. Very easy to use – Select 6v or 12v charging output according to battery type, then connect to the battery and mains power. The rest is fully automatic. Comprehensive & intelligent LED indications • AC power on • battery voltage selection • wrong polarity connection • charging • maintaining (charge completed). No risk of overcharging – AccuMate will automatically detect when the battery is fully charged and switch to maintenance mode. SAFE & foolproof – No worries about wrong connections or accidentally shorting the battery. AccuMate’s circuit board is automatically protected without fuses. Compact, yet powerful – Safely charges batteries from as low as 2v (1v for 6v batteries) unlike most other chargers.